The day is May 8, 1938, the day when Hitler visited Rometo meet premierMussolini. Also on this day, as her entire family (including her fascisthusband) goes to the streets to follow the great meeting and the parade, an Italian housewife (Loren) stays home looking after some domestic tasks. 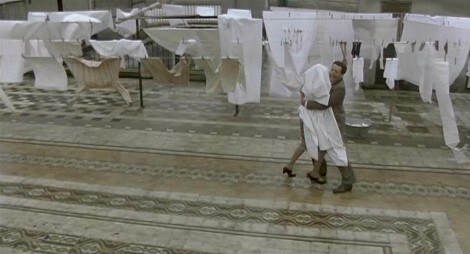 Her apartment building is empty but for a man (Mastroianni) who seems repulsed by fascism (a strange attitude in those days), living in the building across in the complex. As this chamber drama progresses, and loneliness of each is revealed, the audience learns that this man is a radio broadcasterwho has lost his job and is about to be deported to Sardinia, due to his political attitudes and his homosexuality. Unaware of this, the housewife flirts with him, as they meet by chance in the empty building. During their conversation, the rather naïve and mainstream woman is surprised by his opinions and finally shocked when she realizes his sexual orientation. Nonetheless, despite their fights and arguments, a friendship develops and they eventually make love before he is taken away by the police and her family comes back home. It was nominated for Academy Awards for Best Actor in a Leading Role (Marcello Mastroianni) and Best Foreign Language Film. In Italy won 3 Nastro d’Argento for Best Actress, Music and Script; and 2 David di Donatello for Best Actress and Best Director. 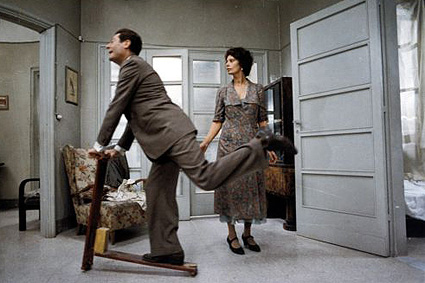 In France, it won César Award for Best Foreign Film. In was nominated for the Golden Palm at the 1977 Cannes Film Festival.